Be the first to share your favorite memory, photo or story of Patricia Ann. This memorial page is dedicated for family, friends and future generations to celebrate the life of their loved one. 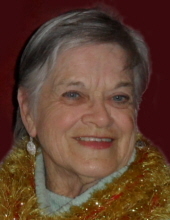 Patricia Ann (Whalen) De La Ossa, died peacefully on Saturday, January 19, 2019 at the age of 82. Pat was born in Athens, Ohio to Michael and Anna Mae Whalen on January 12, 1937. Along with her three siblings, the majority of her childhood was spent in Point Pleasant, West Virginia. It was in Mountain View at the Sylvania Electric offices in 1961, while working in the engineering secretary pool, that Pat met a gentle and loving junior engineer, Pete (Avelino) De La Ossa. Pat and Pete were married at St. Joseph’s Church on August 3, 1963. During their 45th year of wedded bliss, Pete passed away suddenly in 2009 at the age of 73. Pat and Pete raised five children in Mountain View and are survived by; son Gregory and his wife Michelle, son Joseph, son Peter and his wife Tina, son Christopher and is wife Isabel, daughter Anna and her husband Joseph Torres; Pat (Nanny) is also survived by grandchildren: Austin, Brianne, Shelby and Kelsie De La Ossa, Steven Skavdahl and Nicholas De La Ossa, John Lund, Ava and Lyla De La Ossa, Alexander, Gabrianna and Anthony Torres. Pat was fortunate to spend Christmas and her birthday surrounded by her family and learned that her first great-grandchild is due in early summer. During her career, Pat dedicated the bulk of her tenure at Stanford University working in the Career Counseling Department at Tressider Memorial Union. With a life-long dedication to advocating for children and education, Pat is remembered as a tireless parent volunteer having sat on endless committees and in leadership roles in the PTA at Bubb Elementary School, Graham Middle School, and Awalt High School choir program. Within the community Pat is most remembered for her volunteer work throughout the 1970’s as a noon duty aide at Bubb Elementary School; her efforts within the NASA Pioneer 10/Juniper Program and their work to release a USPS stamp; co-founding of the Cuesta park neighborhood block parent program. While participating in an action group, her tenacious energy, helped block the city’s plans to put lakes within Cuesta park. Pat’s family and friends fondly remember her as a dedicated wife, mother and grandmother, with a feisty internal strength and powerful belief in dedicating time and energy to building a strong community. It is this value that she passed along to her children who have each individually committed their adult lives to becoming active community volunteers and civic servants. Pat will be most remembered for this spirit and will be greatly missed by all who knew her. Viewing and memorial services will be held Wednesday, January 30 from 5:00-7:00pm (viewing), 7:00pm (memorial) at Cusimano Family Colonial Mortuary, 96 W. El Camino Real in Mountain View. Interment service will be held Thursday, January 31 at 11:00am at Gate of Heaven Catholic Cemetery, 22555 Cristo Rey Drive in Los Altos. In lieu of flowers, please consider a donation in Pat’s honor to the charity benefiting children, of your choice. To plant a tree in memory of Patricia Ann De La Ossa, please visit our Tribute Store. Memorial Service will begin at 7:00 P.M.
"Email Address" would like to share the life celebration of Patricia Ann De La Ossa. Click on the "link" to go to share a favorite memory or leave a condolence message for the family.